When the price rise has shaken all, it’s not an easy task to handle the expenses of feeding the children. We face a lot of challenges still we won’t compromise on the quality of food that our children depend on! As it is said a healthy mind in a healthy body – To achieve a healthy body, Good food is very essential. You can sponsor for Breakfast, Lunch, Dinner. The expenditure that has to be taken care everyday is: can. Little drops of water to make a large ocean. 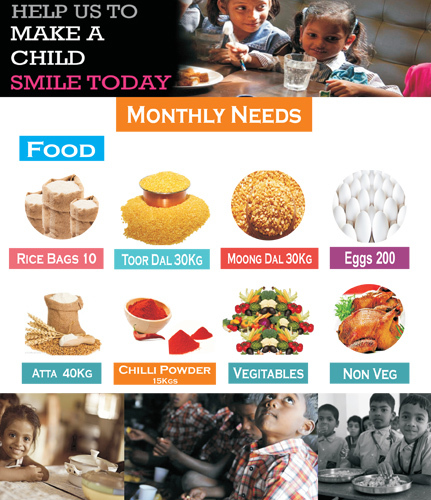 We believe along with affection and care, nutrition is also an essential part of healthy and beautiful life. We don’t want the children to compromise for that and we try our best to give them a better nutrition. Please join our hands and help us to rise healthy children for healthier India. We urge you to make a sponsorship and support us for a loyal cause. You can always support us by buying one or more of the below-mentioned grocery items. You can either buy them and bring them to our place or make an online purchase and deliver it directly to our location.